SINGAPORE – A new report titled Mine Closure Checklist for Governments has just been released to provide policy makers in the Asia-Pacific Economic Co-operation region with the essential elements of a successful mine closure governance framework based on leading international guidelines and standards, as well as international experience. The Checklist is designed to provide a logical, sequential series of steps that will allow policy makers to identify gaps in their current mine closure framework and identify how to address those gaps. A clear, effective mine closure framework will help protect the environment and interests of the community, and will also encourage the benefits that are brought by investment and development of mining opportunities. The Checklist was developed by the Mining Task Force of APEC, in a project led by Natural Resources Canada, with development carried out by Golder Associates. The preparation of the Checklist involved mine closure practitioners globally, including government, industry, and non-government organization (NGO) representatives, among others. Teck Resources was a key partner on the project, and provided industry perspectives on the report. 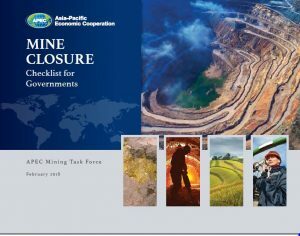 The report is available at no cost at www.APEC.org/Publications/2018/03/Mine-Closure—Checklist-for-Governments.